Does Soda Decay Your Teeth? I’m sure everyone has their favorite choice of beverage, and I’m sure many of you enjoy a good soda from time to time.My father has coke with dinner,a nd my mother loves her Diet Dr. Pepper. We all know from class that drinking sugary drinks might not be the best choice when it comes to gaining weight. However, have you ever wondered how these drinks can affect your teeth? My first question was: Does soda decay your teeth and if so, how long does it take? 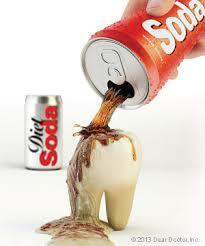 When you drink a soda the acids mix with the bacteria in your mouth to slowly decay your teeth. This article states that the decay process takes about 20 minutes and restarts every time you take a drink of your soda. It also says that those, such as children, whose enamel are still growing, are more inclined to get tooth decay with excessive amount of soda consumption. So, it isn’t really the sugars in the soda, breathe the acids that attack your mouth. IT was difficult to find a particular time frame for losing teeth due to soda, however there were many tips on how to prevent this nasty decay. Many of the common tips include not drinking soda often, Using a straw to prevent the acid from attacking your teeth, brushing your teeth after consumption, and SIMPLY NOT DRINKING IT. A tasty juice or water is a healthy alternative that is much less harsh on your precious teeth. I was also curious if certain sodas were more acidic or caused more decay than others? Well one very harmful drink is Mountain Dew. This drink is so acidic it has even coined the nickname Mountain Dew Mouth which occurs when the teeth begin to decay. However, it is not even the most acidic drink. According to the Mississippi State Department of Health, Pepsi and Coca Cola are the most acidic drinks, right below battery acid. Their acidic levels are at a4.5 on the scale. Right behind them is minute maid orange soda and then Dr. Peper. This was very helpful in knowing how to keep my teeth safe and learning what sodas to stay away from. I am not the biggest coke fan as it is, but after learning how acidic the drink is, I plan to not drink it. I don’t drink soda very often, and I once took a year off for sports and it made a big difference. I am not trying to tell you not to drink soda, but it is clear that it does more harm than good, and it seems to me that it just isn’t worth losing teeth over. This entry was posted in Uncategorized on October 21, 2016 by Claudia Lynn Hatch. One thing that I wonder is if its the sugar or the acid that does the decaying, or maybe both? If it is primarily the sugar then I would be inclined to avoid all sugary drinks like juices and teas, even though they do not seem harmful to my mouth. If it is primarily the acid that causes the decay then I don’t think the other drinks should be too dangerous. Also do diet sodas increase or decrease the rate of decay when compared to the regular version of the soda? Hello Claudia. Great article. and this one really got my attention because I did a similar blog on the sugary drinks. And I agree with you that keep drinking soda could cause the damage to our teeth. Because there are carbon dioxide and acid in the soda. And these things can cause damage to our teeth. But after people knows this fact, but they will still drinks it. Because these soda can make people addicted. Because the caffeines contained in the soda can restore the energy for the people. And sometimes, people needs that, especially college student. So we should start drink less soda or sugary drinks, because it’s not only will decay our teeth, but also will harm our heath, such as diabetes. 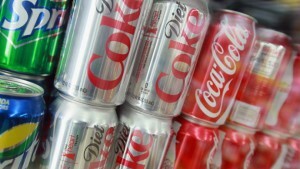 And here is a link that list some reasons why sugary drink or soda drinks is bad for us. This blog was interesting because I definitely can feel how soda has affected my teeth in the past. It feels like there is a film around your teeth after drinking it. Soda can not only ruin your teeth but it also affects your brain. In the article that I read, it says that the sugar you consume from the soda may increase your chances of getting schizophrenia and depression and anxiety. Although these are just claims, they may be accurate. Overall staying away from soda would be your best option. You won’t run the risk of having any health problems from that at least. This post is very informative and helpful. I was never really into drinking soda because I always thought that it was too unhealthy. After reading this post, it’s clear that I made the right decision in not drinking soda. I looked up some more ways on how drinking soda was bad for your health and found this article (http://www.medicaldaily.com/pulse/soft-drink-dangers-8-ways-soda-negatively-affects-your-health-319054) that shares some of the negative effects. I personally don’t like soda and think that there’s no point in drinking it. First off, there is too much sugar in soda. Why drink soda when you could be drinking something like water that is keeping your body hydrated and is healthy for you. I was not surprised to read that soda causes tooth decay. It makes sense that if you drink a lot of soda at a young age you will be more likely to get tooth decay. I think this is easily avoidable if parents make sure that their children do not drink soda. There are plenty other options for drinks besides soda.